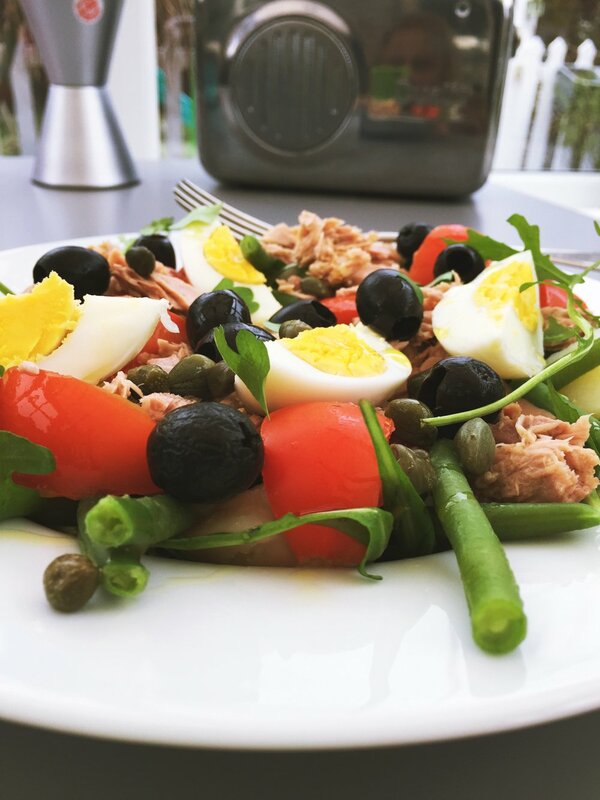 Tuna nicoise salad is one of my favourite salads, so many colours, so vibrant, you can eat it warm, cold, straight away, pack it for lunch or a picnic and you can even throw together the bare minimum tuna nicoise from store cupboard/freezer. It’s a lovely dish for spring lunches or even as a quick midweek meal. I eat it as it is, the kids I must admit like a side of chips or chunk of crusty bread. In another pan put the eggs into water and bring to the boil - gently boil for around 8-10 minutes. Then run them under cold water to cool. Whilst the eggs, potatoes and beans are cooking - open the tuna and toss in lemon juice and chop the tomatoes. Add a handful of rocket to the plates. Peel the eggs and quarter - arrange them on top. Don’t like eggs – miss them out. Use fresh tuna or even salmon instead. Don’t like green beans – try peas. No potatoes – add some pasta or gnocchi. Need to make it from store cupboard – just try pasta (or tinned new potatoes), tuna, olives, capers, green beans, eggs and sun dried tomatoes.